My Daddy, Milroy Powell won the first calf scramble at the Houston Rodeo in 1942. In 1931, the Houston Fat Stock Show and Livestock Exposition was founded and the first show was held at the Sam Houston Hall. In 1938, the show was moved to Sam Houston Coliseum. In 1942, the first star entertainer was Gene Autry, “the Singing Cowboy”; and the calf scramble event was added to the Show’s rodeo and is still a popular event nightly between major events in the rodeo. Facts about the Rodeo: When the calf scramble was added to the rodeo in 1942, each student who caught a calf received a purchase certificate or hard-luck award for $55. Today, the certificates are worth $1,000 donated by an individual or company to buy a heifer. More than $7 million has been awarded since the calf scramble first began. I just think it is amazing!! 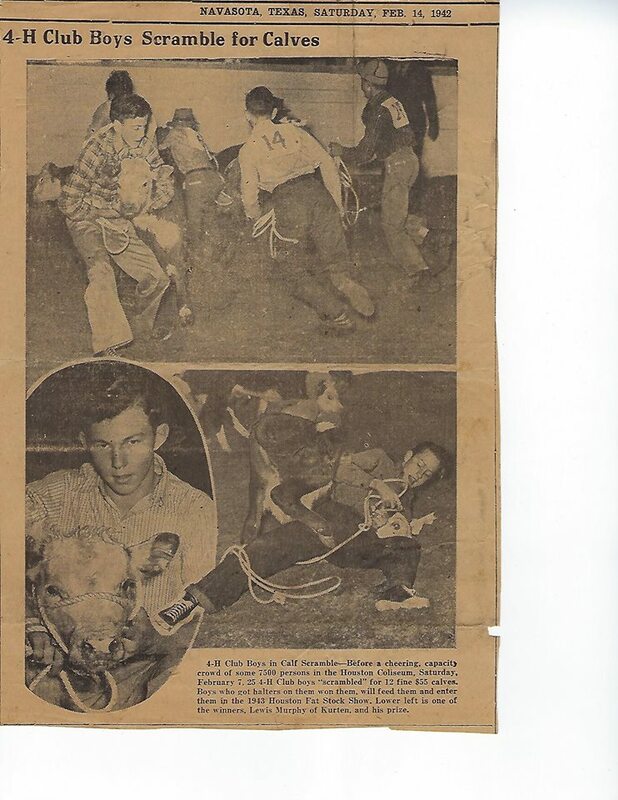 Seventy three years ago, my Daddy would have been 15 years old and was chasing a calf and won the Houston Show!! (UPDATE) Here is what my brother Mark Powell wrote about our Daddy. I want to share with you a story about my dad, Guy Milroy Powell. He went by the name of Milroy Powell. His calf scramble story was told to me a number of times over the years. He caught the first calf in the first calf scramble held at the Houston Fat Livestock Show and Rodeo. He was very proud of this and told the story with pride. The first calf scramble at the Houston Fat Livestock Show and Rodeo was held at the Sam Houston Coliseum. In 1966, after many years in the Coliseum, the show was moved to the Astrodome. I was lucky enough to be at the Houston Show in 1974, showing sheep. Some of my classmates and I bought tickets and attending the Rodeo, one night. We were really enjoying the Rodeo in this giant venue of the Astrodome. Much to my surprise, I heard the announcer say that he wanted to welcome into the arena, Milroy Powell! He was being recognized as having caught the first calf, ever, in the Houston Rodeo Calf Scramble in 1942. I had no idea he was there or this was going to happen, but was amazed and proud to witness his recognition. The best part of this story is you get to read it in my Daddy’s own words from a letter that he wrote to the General Manger of the Houston Show in 1965. This is his story as transcribed as part of that letter. Dad is in the lower right hand picture of this newspaper article. Look at those new tennis shoes! What I can do is look for you a copy of one at Half Price Books. There are more here in Houston I’m sure. When I find one, I’ll put you in touch with the particular location, then you can buy & they’ll ship. It really is like an encyclopedia of the show. The 50th anniversary is a cookbook with entries of recipes from the membership, but the stars also contributed. I’m so glad they honored your daddy. The 75th anniversary was February of 2017. Our grandson Howdy was in the lottery for his last mutton busting before he aged out. I spoke with the committee folks about Daddy & his contribution to our beloved show. His is a tremendous rags to riches story, along with his love for Houston. And that our family was still involved it would be a plus. They simply weren’t too interested. The show is looking forward now & I appreciate their thinking, but you’ve got to occasionally look to the past to succeed in the future. Glad I’ve found your blog! Happy Trails To You. If Leon Hale said it, you can take it to the bank. Sharpest man I’ve ever seen. And the 60th anniversary book has written that Gene Autry enlisted in WWII & couldn’t make the 1942 show. So sorry I haven’t responded til today. This phone in combination with the rain & an old tin roof give me fits. I’ll get those pictures gathered up for today. Wouldn’t it be nice if I’d mentioned Daddy’s name? Billy Foye “Bill” Moser. Born February 28, 1925. The Stock Show was first week of February & he turned 17 on the 28th, enlisting in the Army Air Corp. Tge family hailed from Wise County, Texas and moved to Houston in 1935. If you all are familiar with the Houston Rodeo, my husband and I own the stagecoach owned by Bill Williams, a big part of the show way back whe. I can’t tell you how happy I am to find your post. I have the book for the 50th anniversary of the Houston Livestock Show & Rodeo, what we called The Fatstock Show. Mind you I’ve had this book since 1982. All our growing up lives our Daddy sponsored a calf through his company, Builder’s Hardware, Inc. 5101 Holmes Rd (now South Loop East). His partner was “Buck” King, son of the King Cattle & Timber, King Center & C E King High School fame. Daddy couldn’t have been any further down the economic ladder. Head of household at 10 yrs old, he manned his own ice truck & delivered to the roughest ice houses in town in 1935, Airline, Parker, Tidwell area. To my surprise there was a section about the scramble & it’s beginning. Where was my head the 100 times I’ve read the book? My Daddy at 16 yrs old was on the inaugural donors list with the likes of Governor Coke Stevenson & one of the original members of The Lightcrust Doughboys & teacher to a young Bob Wills, Mr. Pappy Selph. I’d say my Daddy & your’s were steppin in high cotton. Couldn’t be prouder for either of them. Looks like they both did ok for po’boys. I will look at the photos in the book tonight to see if it’s your Daddy in the same book. Let me know if cut & paste is available. If not I’ll email it to you if you want me to. My calf certificate was good for $125, but a good calf cost $250, and we didn’t have the money. Dad asked my sponsor, a Houston doctor named Robert C.L. Robertson if they could split the difference, which they agreed on, and Mr. Hendricks, the Menard Vo Ag teacher, Dad, and I traveled to Madisonville and bought the most beautiful calf from Ralph Johnston, a Houston Fat Show director, who I was advised by my Dad would be good politics for the Fat Stock Show the following year. I renovated and painted an unused feed house at the ranch and built a fence for his pen. We had two milk cows, but had to buy corn, wheat, and cotton seed meal, and make monthly reports to Dr. Robertson. We named the calf “Charity Ball” because he was a bargain and lost his balls. A pretty calf, but the long trip from Menard caused him to get off his feed and get diarrea. He was drawn at show time, but healthy. Charity Ball went through three or four sifts, but didn’t make it to the finals, and I was required to sell him for 2 cents over market after the show. Lost a bunch of money, but it was a good effort. Gene Autry played the Houston stock show from 1942-45, 1947 and 1948, and 1955. It was Eddy Arnold I met in 1953 when I caught a calf in the Houston Calf Scramble. I was fixing to go into the arena and he was on his horse at the next gate and we said hello to each other. Big thrill for me!